The last five years have been an unprecedented expansion of technology in the field of dentistry. Now more than ever, we are able to deliver better care through better diagnostics and increased precision to deliver predictable esthetic outcomes. Optimal implant results in the esthetic zone can be predictably achieved using customized, patient-specific abutments. Our latest Cerec3D esthetic implant abutment can give you this excellent result. After an impression has been made of the healing abutment in place, an optical scanner reads the codes from a resultant cast to determine implant size, location, hex position, and soft-tissue levels. 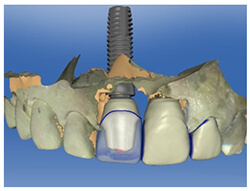 A patient-customized final implant abutment will be then designed and milled. The abutment margins closely follow gingival levels and the form is idealized, contributing to a more optimal emergence profile and gingival architecture. The goals of implant dentistry have evolved beyond the mere provision of secure function to encompass the achievement of natural-appearing restorations. One such innovation is the shift from conventional stock and cast-custom abutments to patient-specific abutments produced through CEREC3D system. These esthetic implant abutments are created for each individual patient and therefore have the potential to provide optimal peri-implant soft-tissue support, a prerequisite for achieving ideal esthetics, resulting in a more accurate fit than was previously achievable Moreover, because the CAD software assists the technician in creating the abutment design, this precision can be produced with great consistency. This data will be then transferred to the CAD software, the implant abutments are virtually designed, and the CAM milling apparatus produces the final esthetic implant abutments which achieving your goal. With this CAD/CAM technology, the esthetic implant abutments have expanded the applicability of implants in the esthetic zone by contributing to ideal marginal abutment form and maximal peri-implant support. We can also select the superior shades of your ceramic crowns and natural hues through the marginal tissues.